Home	Board index Genii Light from the Lamp ONLINE. Read exclusive online reviews of products and discuss them. While customized cards have their appeal, most savvy magicians will recognize that looks can also distract from the effect, and will prefer to use a more standard looking deck, so that all the focus can be on the magic. That's why lately I've been using my two-deck set of ARRCO Playing Cards, one red and the other blue. This classic deck was recently the subject of a 2018 reprint, albeit in limited numbers. The Arrco playing cards have a long history, and still have many enthusiastic devotees due to the admiration and popularity they enjoyed especially from many magicians. So let's first set the stage by learning something about the brand name. Shown here are a couple of the original Arrco decks which have now been the subject of a 2018 reprint. In their prime, Arrco decks were a hot commodity, and they continue to be a beloved and nostalgic deck for many magicians today. 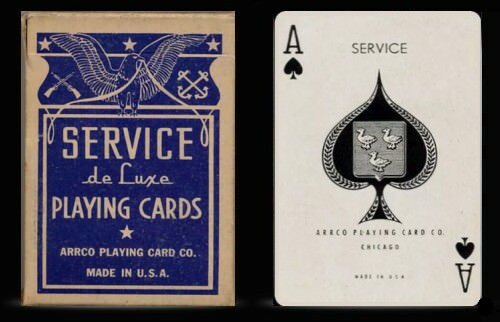 The ARRCO Playing Card Company started operations in 1927, but under a different name: Arrow Playing Card Company. The Arrow Playing Card Co was led by Theodore Regensteiner, who was the inventor of the four-color lithograph press. Based in Chicago, the company took Chicago's "Century of Progress" World's Fair in 1933-34 as opportunity to announce its new identity under the name Arrco. 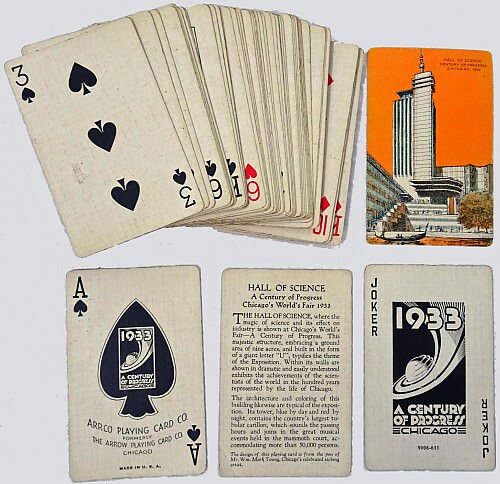 In conjunction with this, Arrco produced a promotional deck entitled "Century of Progress Playing Cards" (shown below). This was a tribute to the fair, and also sought to capitalize on thousands of visitors to the Fair in order to promote the look and feel of its new cards. Already at that time the Cincinnati-based USPCC was an industry giant, but Arrco soon gained a loyal following of its own. This was largely due to its high quality card stock and elegant graphics, which it made available in a signature red and blue, just like the reprint that is the subject of this review. But despite it's signature red and blue decks, Arrco also also produced many other playing card designs, including many that used original art prints. 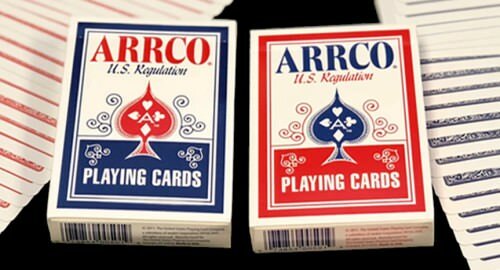 In the years that followed, Arrco continued to improve the quality of its playing cards, experimenting with better cardboard and better finish, and eventually earned a solid reputation as a lively competitor to USPCC. In 1941 Arrco made a real break-through that would contribute significantly to their later success, when they developed what they called their "Plastic Coated Duratone Cards". The innovation here was that these cards had a special special coating that made it possible to clean the cards with a damp cloth. "It's a quick trick to remove soil, candy or ink stains from Plastic-Coated Duratone cards ... a damp cloth, a wipe, and presto - they're like new! At this time, not even a magician could supply the tremendous demand for Duratone cards." 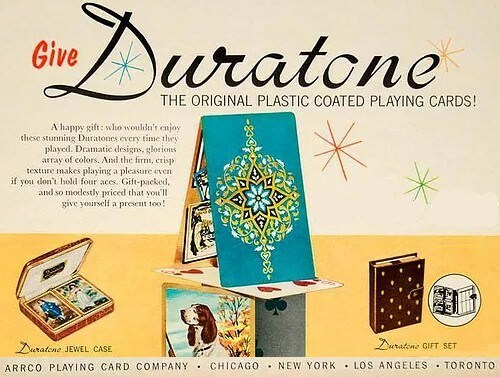 As evidence of their popularity and success is the fact that the US government made large orders of the cards with the new Duratone finish for the army. A special deck design was even produced by Arrco for military service members. Arrco continued to churn out playing cards well into the 1980s, but in 1987 the Regensteiner family decided to sell their operations. The publishing arm of children's books was taken over by Grolier Inc, while the playing card division was taken over by its long term rival USPCC, which had gobbled up many other competitors already. USPCC continued publishing decks of playing cards under the Arrco brand for another decade or so. But while the original Arrco decks were plastic coated, USPCC printed the decks in their usual paper stock. Despite this change, the Jokers continued to say "Plastic Coated" as part of their iconic design. 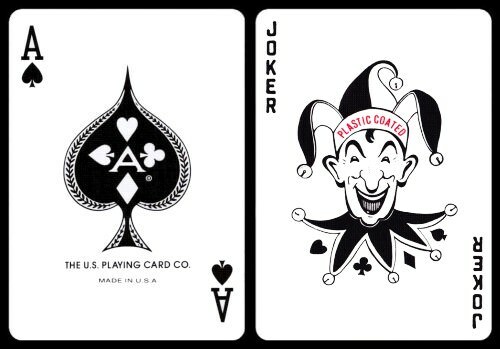 As such, the Arrco decks handle the same as other USPCC produced paper playing cards with an air cushion finish. The Arrco playing cards continued to be beloved by many card handlers, and highly regarded for their looks and their performance. In its hey-day, the signature Arrco back design in red and blue was very popular, and is still considered beautiful today, with many people loving the quality and design of the classic Arrco design. For example, here's how Paul Lelekis describes his experience with them: "I used AARCO's exclusively since the late 1980s, for years while table-hopping, until they became unavailable. These decks fan easily, they last longer (performance-wise) than Bicycles, and I have stuck thousands of these cards on many ceilings. They are my all-time favorite cards to use and are very easy to manipulate. AARCO's are the best performance cards in the world." 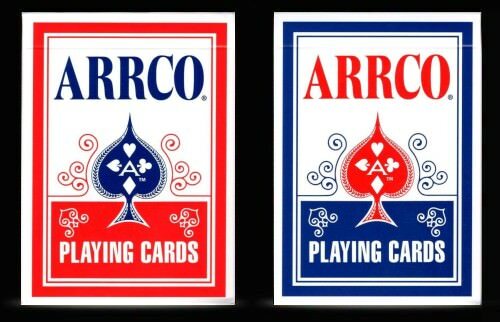 But eventually the popular Arrco brand started to fade into obscurity, and USPCC discontinued the decks; hence the need for a reprint. The standard Arrco deck is still in demand, and I've been told that 2011 was the last time it was most recently reprinted. 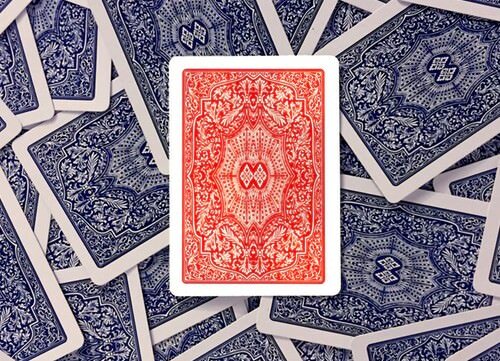 Will Roya from PlayingCardDecks.com was able to secure an arrangement with USPCC to produce a limited edition reprint in 2018, in order to bring this very practical worker's deck back into print, with 2,500 copies of both the red and blue versions of the deck being produced. For the most part the tuck case of the 2018 limited edition reprint is the same as the original deck, but some modifications have been made to fit USPCC's requirements. For instance, as far as I could tell, the original Arrco decks said "US Regulation" on the front of the box, but this isn't on the 2018 reprint. But besides small differences, the tuck box does otherwise features the classic ARRCO look in red and blue, with the back of the box featuring the design of the card backs, either in red or blue. For additional looks as a pair, the red box has a blue seal, while the blue box has a red seal. 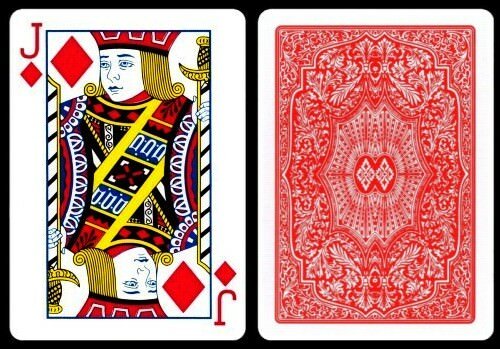 Identifying the 2018 reprint is a simple matter - the bottom of the tuck box has the PlayingCardDecks.com logo and brand information, while the flaps inside the tuck box have a card reveal: a Jack of Clubs on the red deck and an Ace of Hearts on the blue deck. The card backs have a generous white border, and feature the classic and intricate design for which the Arrco brand is famous. It's far more detailed and complex than most back designs, and this is exactly why many people love it. Yet it retains the mirrored symmetry that most people prefer to see on a card back. 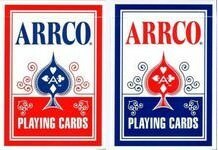 Apparently when Arrco was a separate company, this is the back design used on their Club Casino and Duratone Club Reno brands of playing cards.﻿ It is still revered by many magicians and professional card handlers around the world. 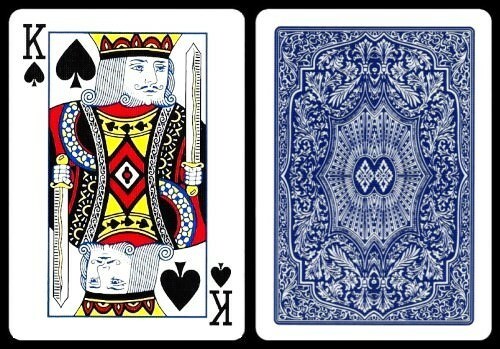 The card faces have a traditional and standard look, although the court cards are not the same as what you'll see on a standard Bicycle rider-back deck. The colours are the same but the patterns are not, with a slightly more intricate design that seems more sophisticated and less garish. It also cleverly incorporates tiny suit pips on the clothing of the characters. Quite frankly, personally I prefer these court cards over the standard Bicycle rider-back courts! The number cards are standard, and complement the court cards well. The observant will notice that the shape of the pips is slightly different than those of a typical Bicycle rider-back deck. 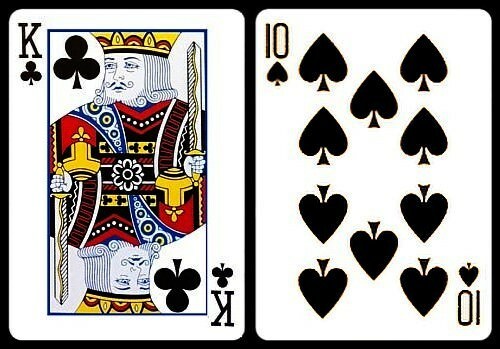 The Ace of Spades features an over-sized pip which incorporates the four pips. Maybe it's a coincidence, but the arrangement of the spade and the club pip reminds me of an arrow - perhaps a faint vestige of the company's original Arrow name? The two Jokers feature a smiling Jester face. The "Plastic Coated" reference is somewhat of an anachronism, since these are very definitely ordinary playing cards with USPCC's usual embossing and Magic Finish for smooth and consistent handling. But it is a remnant of an iconic design, so it has been preserved as part of the artwork, even though the cards today are no longer plastic coated. Each deck also includes two extra gaffs not present in the original Arrco decks - the red deck has a double facer and red double backer, while the blue deck has a blank facer and a red/blue double backer. 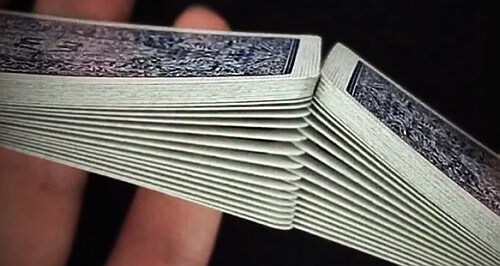 This makes it a good idea for magicians to get both decks, because then you get a full set of gaffs: a double faced card, blank faced card (blue back), plus two double backers (one in red, the other red/blue), which enables you to perform a range of different effects with these decks if you are into card magic. For good handling, these decks have an embossing air cushion finish, with a traditional cut, and the usual smooth performance you'd expect from a USPCC produced deck. Some will be surprised by that, since the original Arrco decks had a slick finish. The plastic coating and smooth finish was part of the appeal of the original Arrco playing cards for some people, although personally I much prefer the embossed air cushion finish, as do many others. Some people insist that the original Arrco decks lasted a lot longer than the Bicycle riderbacks, and that is possible, given the use of a plastic coating and a smooth finish. But these are no longer plastic coated, and are made in exactly the same way as all the other decks produced by USPCC, so their durability and performance can be expected to match modern decks, not the original Arrco decks. Magicians have long loved these decks, while collectors will also appreciate the opportunity to seize a piece of history. While their performance won't be identical to the original Arrco decks, like other USPCC produced decks they will perform well. And of course they feature the artwork and design that some magicians feel strongly connected with, so that will give them an immediate appeal for some. When performing magic, we are often looking for something relatively unobtrusive and practical that still retains some degree of elegance, and the iconic ARRCO Playing Cards fit those criteria beautifully, while handling well at the same time, so I've enjoyed using them. 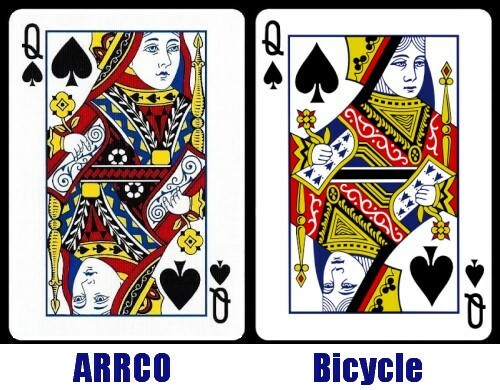 If you've ever used Arrco decks in the past, or have any memories of them, I'd love to hear some stories about them! Last edited by EndersGame on August 28th, 2018, 8:57 pm, edited 1 time in total. What made these cards great, in their original form, was the stock and the finish. Those cannot be reproduced. I love these cards, but if you stare at them long enough they start to look like a doily pattern. At least the Joker looks like a joker. The Bicycle one looks nothing like a joker. Richard Kaufman wrote: What made these cards great, in their original form, was the stock and the finish. Those cannot be reproduced. You are referring, presumably, to the plastic coated Duratone finish, and not when these cards first were printed on standard paper by USPCC? Or did USPCC continue to print them with the Duratone finish for some time even after they took over from ARRCO?